Barbara Thorson (Madison Wolfe) is a modern hero: a quick-witted, sharp-tongued middle-schooler who isn’t afraid of anything. As the only girl in school who kills giants and carries an ancient Norse war hammer in her purse, why would she be? While we desperately want to protect our kids from the brutal reality of an often unforgiving world, it isn’t always possible to shelter them from pain. Sadly (yet, understandably) many children struggle to deal with such overwhelming emotions and, as a result, hide within fantastical worlds of their own imagining. The film industry has an important role to play in exploring how children cope with feelings of pain, grief and loss. Many movies examine how fantasy can help this process or, as in Barbara Thorson’s case, hinder it in a complex web of denial... and giants. Featuring a powerful central performance, Anders Walter’s I Kill Giants is a moving and insightful film. Madison Wolfe is brilliant as Barbara (following her impressive turn in The Conjuring 2). She is smart and strong, more than aware of her situation and just as determined to hide from reality. Barbara creates an elaborate fantasy world to escape from the pain that is closer to home. Here, she casts herself as a saviour - a warrior with the ability to protect those around her. In deeply poignant scenes, we see why she needs to believe herself capable of such victories. Indeed, her fantasy existence is so rich and compelling that we also want to believe in giants - even as we understand the inherent dangers of this world. Helped by her sister (a beautiful portrayal by a rather underused Imogen Poots), her new friend Sophia (Sydney Wade) and her counsellor, Mrs. Mollé (a sensitive performance from Zoe Saldana), Barbara must face her toughest battle yet - acceptance of reality. However, Barbara’s story (based on the graphic novel by Joe Kelly and J.M. Ken Niimura) gripped, entertained and moved me - serving as a poignant reminder of the power of the imagination. I Kill Giants has, of course, been compared to JA Bayona’s A Monster Calls. While the two films have definite similarities, there are also significant differences. A Monster Calls is the more accomplished of the two movies (it certainly benefits from a more generous budget). However, I found I Kill Giants more enjoyable for being less emotionally manipulative. 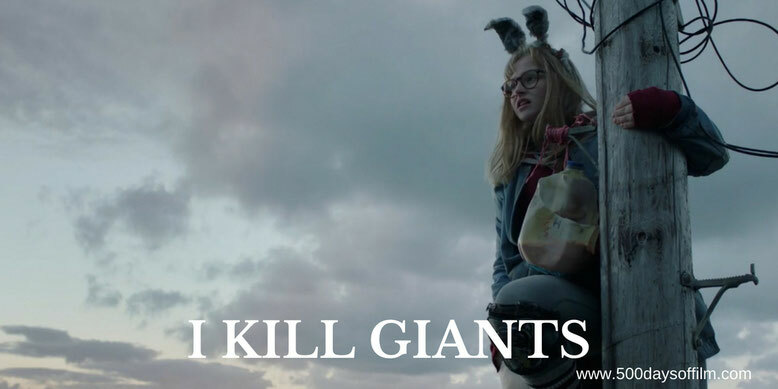 Have you seen I Kill Giants? If you have, what did you think of this film? Let me know in the comments section below or let’s chat about this film over on Twitter. I’m @500DaysOfFilm.